We - Druckguss Service Deutschland GmbH - are a globally oriented company based in Lübeck. Our core competence lies in specialized machine manufacturing and engineering, especially die casting machines. We attach great importance to service and know-how. Through our experience and continuous training we are offering, among other things, excellent and certified quality in the field of state-of-the-art production technology (according to DIN EN ISO 0991) as well as in our welding department (according to DIN EN ISO 3834-2 and EN 1090 EXC 3). Clear and brief! What does Druckguss Service Deutschland do? In the term from 12/3/2018 to 23/3/2018 we have the pleasure to share our daily routine with five interns of our cooperation partner the Willy Brandt Schule in Schlutup. These interns are supporting us in different departments. Two girls are placed in the office as an industrial manager, two boys are working in the drilling departement and the last girl supports the mechatronics. The two dedicated interns of the office have written a small report about their first week in our company. 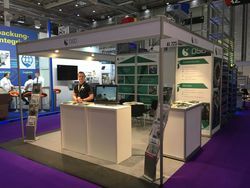 The manufactoring trade fair in Hamburg has gone and we can look back to an interesting and successful week with great conversations and discussions. We want to thank everyone who visited us in Hamburg and we are looking forward for the next meeting of the manufactoring variety of Germany. The team of Druckguss Service Deutschland GmbH is happy about the successful exhibition in Nuremberg. We had interesting conversations and also a great atmosphere at our booth. We want to thank every companion, customer and visitor for visiting us at the EUROGUSS 2018, we hope to meet you again in 2020.